There were to be feints that were intended to draw Ottoman attention away from the main assault on the peaks at dawn the next day. The first of these was in the south at Helles, once more the focus of the 88th Brigade of the unfortunate 29th Division, committed to battle at Fir Tree Spur, across the patch of ground known as ‘The Vineyard’. As was customary at Helles, the attack was in broad daylight in the late afternoon of 6 August, the assault at 5pm following a 2½ hour bombardment. Like others before it, it was a failure; trenches were taken and lost to the seasoned Ottoman troops. Inexplicably, the battle was rejoined with another bombardment the following day, the 42nd Division taking the brunt. It too was to achieve nothing. The diversion would drag on until 13 August; the Ottomans were aware of both the feint and the likely British intent, and, unconcerned, committed two divisions from Helles to the battlegrounds of Anzac. Closer to the point of conflict was another diversion at Lone Pine, the distinctive single-pine ridge across from 400 Plateau, along Second Ridge. The intention here was an all-out assault to distract the Ottomans, while the British were similarly engaged in the south. Yet, at Lone Pine, trench warfare had been developed to a high science. The Ottomans had created a formidable fortification, their trenches reinforced and roofed with timber baulks to prevent losses by shell and grenade. Like the battles at the Vineyard, Lone Pine has become a microcosm of the whole Gallipoli campaign at Anzac; hard-fought, but ultimately futile. So, on 6 August, at 5.30pm the attack was launched by the Australian 1st Division, following an artillery bombardment in ‘lifts’, the line of exploding shells moving progressively inland. Attacking over open ground, they found their route blocked by barbed wire, the roofed trenches with loopholes almost impossible to assault from the front. Not to be outdone, the Australians found their way into the underground maze from the rear, along communication trenches; the resulting hand-to-hand fighting below ground bitter and bloody, its aftermath, a charnel house. Our casualties in this fighting amounted to 2,000 men, but the Turks themselves acknowledge losses totalling 6,930 in their 16th Division, and of some 5,000 were sustained in a small sector of the Lone Pine trenches. God forbid that I should ever see again such a sight as that which met my eyes when I went up there: Turks and Australians piled four and five deep on one another. Like the diversion at Helles, this battle was to rage for three days, and though capturing the Ottoman trenches, it failed in its prime purpose. Rather than diverting the attention of the Ottomans at Anzac away from the main assault, it was to attract reinforcement of two regiments from the 9th Division in Helles, and this at a cost of 2,200 Australian casualties, and goodness knows how many Ottomans. The assault against the peaks of Sari Bair was to be commanded by Major General Godley of the Australian and New Zealand Division. On the night of 6 August, as the two feints were being fought out, the two assaulting columns were to leave the Anzac perimeter, striking out to the west to circle around the westwards facing foothills of the Sari Bair Range. The left-hand column was composed of the Australian 4th Brigade and the 29th Indian Brigade; closer to its target the two brigades would separate to form three assaulting columns, the Australians targeting Hill 971 (Koçacmintepe), the Indians Hill Q. The right-hand column was composed of the men of the New Zealand Infantry Brigade, its main focus was to be Chunuk Bair. However, both columns were understrength and included men weakened by dysentery, an inevitable by-product of the summer months’ campaigning in Gallipoli. 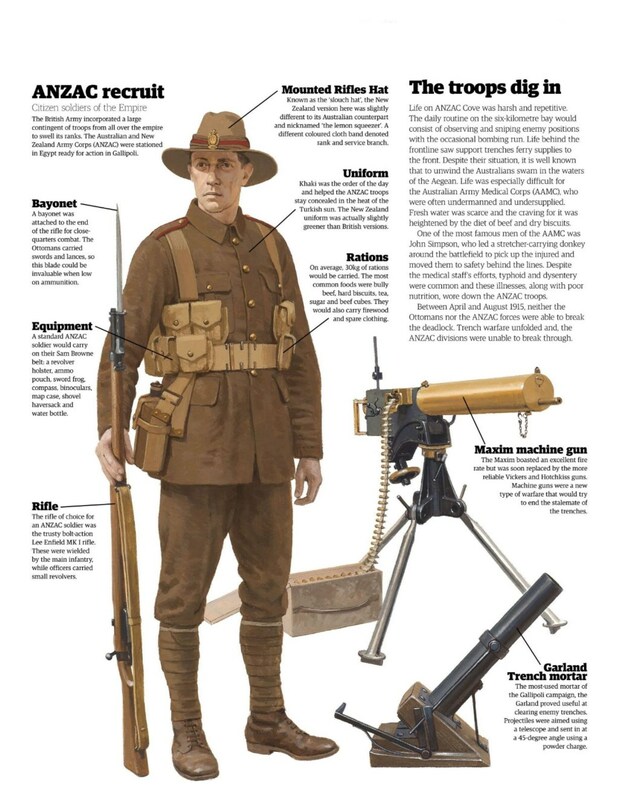 The two columns moved to the margins of the Anzac perimeter, in the hands of guides who had knowledge of the intricate mass of gullies and ridges caused by the action of wind and water over centuries. Any Ottoman defences soon evaporated, but the left-hand column, commanded by Brigadier General Monash, got into difficulties. Fighting its way through the scrub to a watercourse, the Aghyl Dere, Ottoman resistance stiffened. Exhausted, the 4th Brigade would go no further that night: Hill 971 would have to wait. In fact, the left-hand column would never get close to Hill 971; though resuming the attack approach on the morning of 8 August, there was still confusion about which direction to take. Hill 971 would remain unassaulted. Behind them was the Indian Brigade; slowed up by the tortuous terrain, they too would be dispersed, a long way off their objective. Only the 1/6th Gurkha Rifles got anywhere near Hill Q, within 200ft of their objective by 6pm. They would make their assault the next morning at 5am, following a naval bombardment. With no other battalions in support – all the others were lost in the gullies – they made a heroic assault on the hill that drove off the Ottomans. Tragically, they would become victims of their own naval support, and with no reserves, they lost their tenuous grip on Hill Q. The right-hand column of New Zealanders, operating within the more familiar Anzac perimeter, fared a little better – but were still held up by Ottoman resistance. By dawn on 7 August some had reached Rhododendron Ridge, a spur that leads right up to Chunuk Bair; while others were lost in the complex terrain of ridges and gullies. Brigadier General Johnston, commanding the column, waited until he had sufficient men to continue the assault against what was still an unknown level of resistance. This was to prove a costly decision; it was to deeply influence the outcome of the attack by the Light Horse Brigade at the Nek, which was to take place at 4.30am on the 7th. As the Light Horse were pushing to Baby 700 – the hill that had been the focus of so much attention during the landings – it had been intended that the New Zealanders would be pressing on from their newly captured positions at Chunuk Bair, thereby crushing the Ottoman defenders between them. It was not to be. In the absence of the New Zealanders, the attack at the Nek went ahead on the orders of Godley. 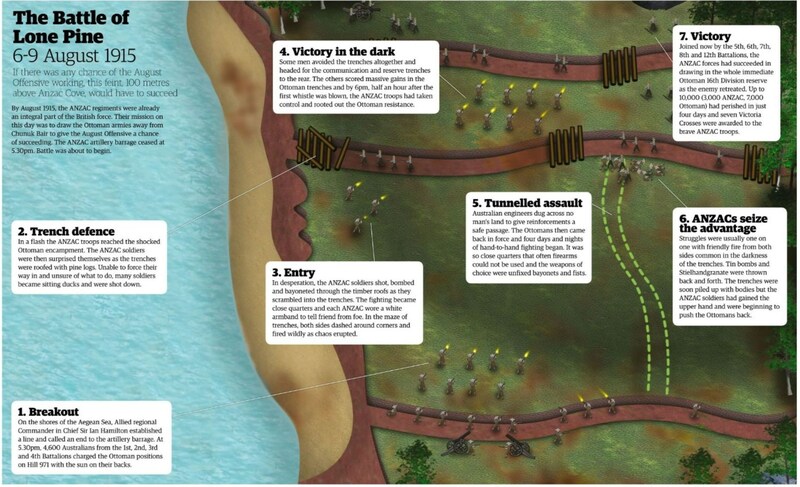 Rising out of their trenches, the attackers were armed only with unloaded rifles and bayonets. The Ottomans wrought havoc with their withering fire, and the three successive waves of light horsemen were mown down – 378 casualties out of 600, 230 of them killed. Their bodies would remain on the battlefield, only to be gathered in after the war was finally ended. For the New Zealanders on Rhododendron Spur, things were difficult. The Ottoman defenders were stiffening, the commander of the 9th Division, Colonel Kannengiesser was in position on the hilltop. Godley issued the terse order: ‘Attack at once’. The Auckland Battalion took heavy casualties; while Johnston ordered the Wellington Battalion into position, its commander refused to attack in daylight. Dug in as best they could, the New Zealanders were reinforced by two newly arrived battalions of the 13th (Western) Division, the 7th Gloucestershires and the 8th Welsh. At 3am, the peak of Chunuk Bair was to be taken by the Wellington men, and the Glosters. The navy had played its supporting role – the Ottomans had no way of digging down into what was hard and rocky soil, and were hopelessly exposed. However, this factor would come to count against the Allies. The new defenders of the peak now found themselves in Ottoman crossfire, from Battleship Hill to the south and from Hill Q to the north – both of which would have been taken by now if things had gone to plan. By 5am, the Ottomans launched a desperate counterattack, reinforced by the 8th Division recently arrived from the Helles front. As the scale of the assault unfolded, von Sanders appointed Mustafa Kemal as commander in charge of the defence of Sari Bair. By that evening, the New Zealanders and New Army men held on grimly, their casualties mounting – the Wellington Battalion would lose 711 out of 760, the New Army battalions suffering similarly. With Chunuk Bair holding, Hill Q would be assaulted on 9 August by a mixed force, led by Brigadier Baldwin, of four battalions from the 38th, 39th and 40th brigades of the 13th Division, and two battalions from the 29th Brigade of the 10th (Irish) Division. 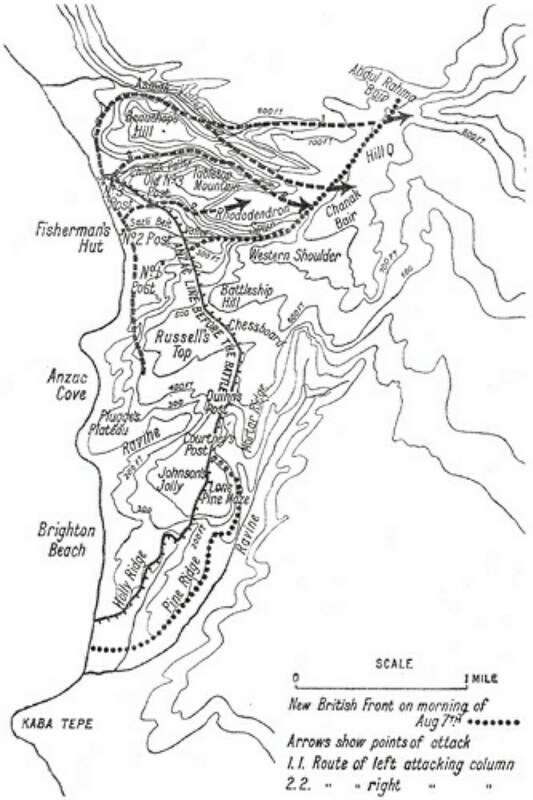 Climbing to a flat area called ‘The Farm’, they moved up a feature known as Chailak Dere in order to take the assault to Hill Q, while New Zealanders from Chunuk Bair and the Indian Brigade would also attack the hill. Baldwin’s men met with stiff opposition. The only force to reach Hill Q was a battalion of Gurkhas, but they would be driven off by their own naval artillery fire, delivered from the newly arrived ‘monitors’ (gunships sent out to replace the capital ships) and the ageing battleship HMS Bacchante. When Mustafa Kemal gave the signal, 5,000 men in 22 lines charged on the New Zealanders and the British at Chunuk Bair. One second later there was only one sound – ‘Allah … Allah … Allah.’ The British did not have time to fire and all the men in the front-line trenches were bayoneted. The British troops were wildly scattered. In four hours’ time, the 23rd and 24th Regiments regained the lines at Chunuk Bair. The 28th Regiment regained Pinnacle (the highest point on Rhododendron Ridge). Just after the Turks regained Chunuk Bair, the Navy and artillery began firing. Hell let loose. Iron rained from the skies over the Turks. Everybody accepted their fate. All around people were killed and wounded. While Mustafa Kemal watched the fighting, a piece of shrapnel hit his pocket watch. The watch was broken but protected his life. He had a bruise on his chest, but nothing else. He was destined to save the country. The exhausted New Zealanders had been relieved by the 6th Loyal North Lancashires, who had arrived at 10pm (a second battalion, the 10th Wiltshires, had not yet arrived). The force of the Ottoman attack was to prove too much; breaking over the British battalions and sweeping them down the slope into the confusion of gullies below. Baldwin’s men at the Farm would suffer the impact of the Ottoman charge. Hill Q was no longer occupied and Chunuk Bair, so fleetingly held by the Allies, was now firmly back in Ottoman hands. The struggle for the heights was over; the campaign effectively finished, dead in the dark waters of the Dardanelles Straits.